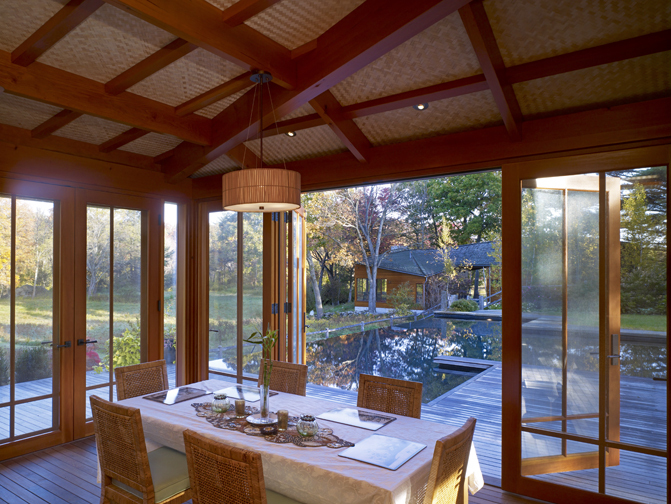 A young couple with children asked Charles Rose Architects to design a “contemporary Polynesian hut” for their property southwest of Boston on the Charles River. The design called for indoor and outdoor sitting and dining areas; kitchenette; stainless steel outdoor shower; bath/changing area; 1,500 SF deck with in-ground hot tub; and a fire pit with built-in seating. The architect carved out one corner, creating a covered, but open and airy, outdoor lounging area. 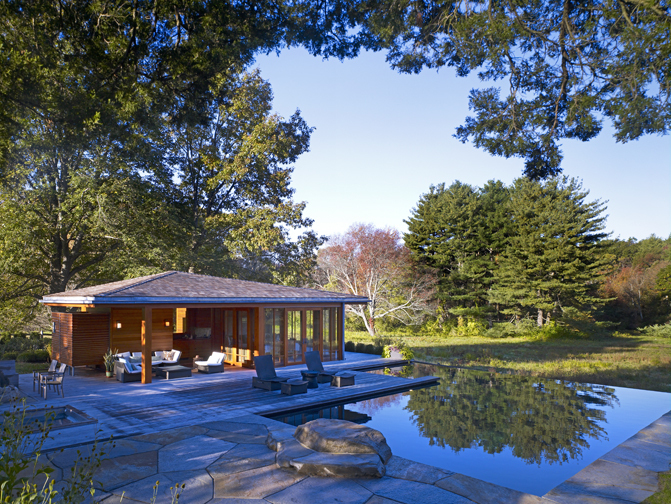 Everyone agreed that the new pool house should be wood construction — primarily to match the look and feel of an earlier project the architects designed for the clients, a wood-clad “play barn” with two large rooms, divided by an outdoor space framing views of an adjacent pond. That’s where Bensonwood came in. 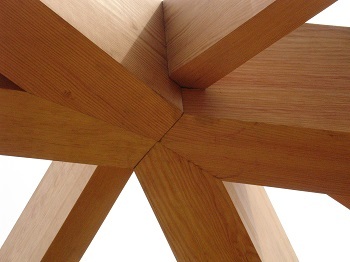 Our timbered Douglas fir frame supports an asymmetric hip roof whose peak is pulled off-center so that the pool house subtly connects with the geometry of the existing play barn. Our timberframer C.J. 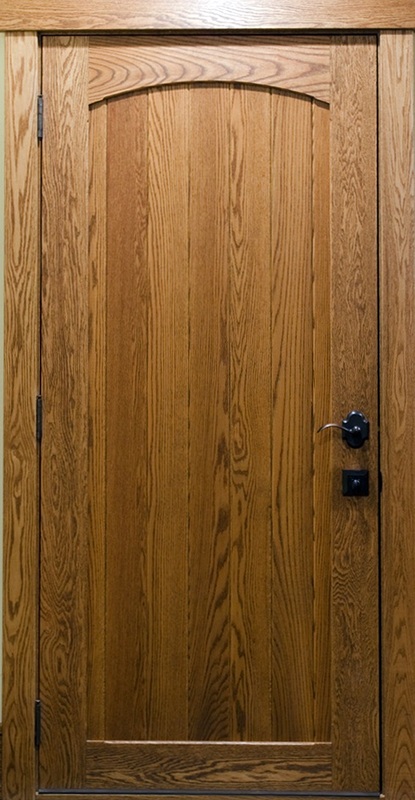 Brehio was the job captain, and did a masterful job executing complex compound joinery. Custom concealed steel connections were also used throughout the building. 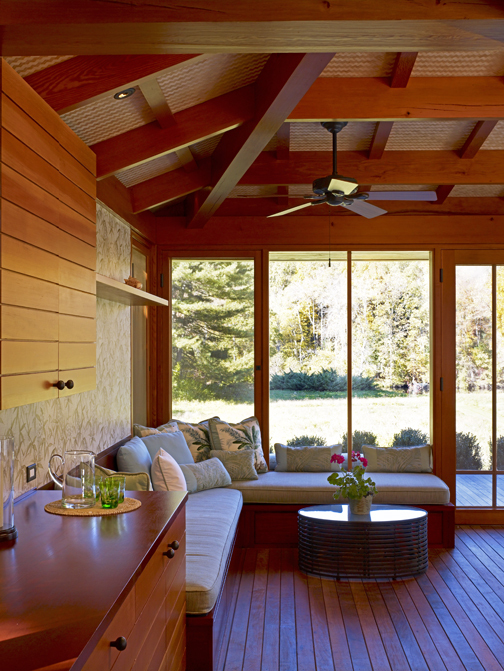 Western red cedar lends rich, warm hues from exposed beams, custom doors and millwork. The stainless steel shower structure was was a built by Alstead, NH welder and metal sculptor Bob Taylor and has a unique sand blasted finish and unique hardware such as flush mounted tapered screws and a big piano hinge for the door. In keeping with this month’s “Everyone into the Pool” theme, here is a charming little pool house we are helping fabricate on Cape Cod. Designed by Rebecca Elsy Ribeiro of D. Michael Collins, Architects, the energy-efficient building features classic colonial carriage house styling with cupola and a sheltered overhang. Bensonwood is crafting the timberframe, insulated wall and roof panels, and installing the Marvin Ultimate windows and a Marvin outswing bifold door. 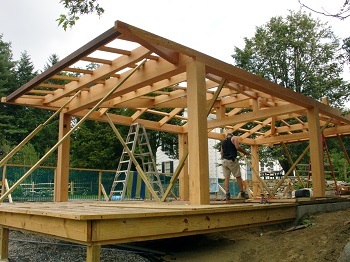 The timberframe consists of Douglas fir glulam timbers for the main structure and for the exterior timbers​. Kenneth Vona Construction, a company that very much shares Bensonwood’s values, will be the builder. 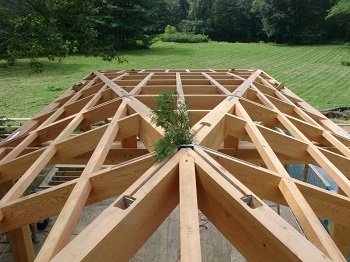 KVC is not only one of New England’s oldest and most respected custom builders, it is also one of the greenest. Their ideal six-sided building envelope is one that breathes, insulates against losses, sheds water away for sustainability and remains energy efficient and reusable. Like Bensonwood, KVC believes a commitment to environmental responsibility results in immediate payback and comfort. D. Michael Collins, Architects is a small, but high-quality design firm established in Natick, Massachusetts, in 1987. 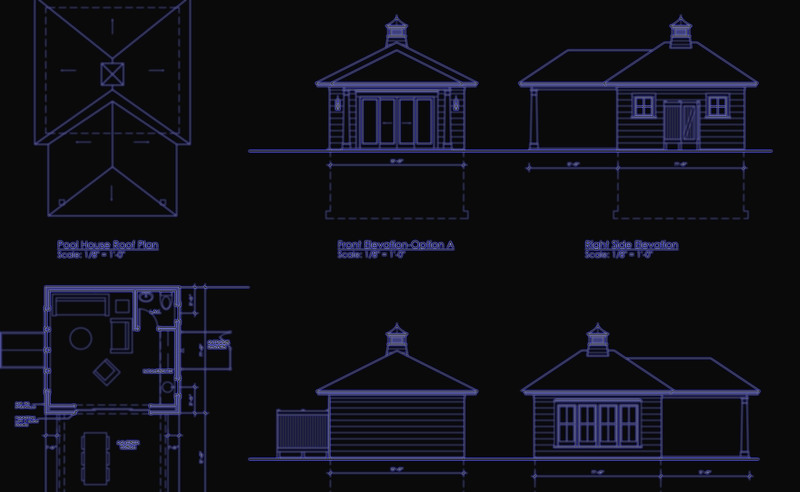 They specialize in new custom homes, additions and renovations, small scale commercial, institutional and historic restoration projects. Most of the firm’s projects are located in Massachusetts, but they also have projects in Maine, New Hampshire, Vermont, New York, Colorado, Florida and the Caribbean. We’ll profile more design-build collaborations with D. Michael Collins, Architects and Kenneth Vona Construction in the months ahead.